Decreased Latency – CDN allows the download to occur from the closest server to the user. Increased Parallelism – The local web server can be serving up content while the other connection is pulling from Google. However, there is a caveat. What if the connection to Google goes down? Can your site survive without jQuery? It should, if you developed the site with a responsive design and progressive enhancement. The answer is to fall back to a local copy (code sample below). Write a script tag that refers to Google’s CDN. If the object does not exist, then dynamically write another script to the page that refers to the local file. I learned this concise technique while watching a Twitter Bootstrap 101 tutorial (kudos to David Cochran for the great videos) that referred to this best practice that appears to have come from the HTML5 Boiler Plate project. 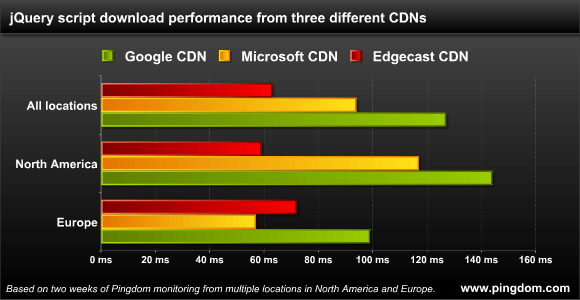 By the way, the numbers (from Pingdom) support Google as being most likely the best CDN to use.